Rare Sighting Of Dashing, Two-Legged Hairy Sprinting Crab? : Krulwich Wonders... It's Meryl Streep in octopus form: The mimic octopus can take the shape and color of an incredible variety of sea creatures. 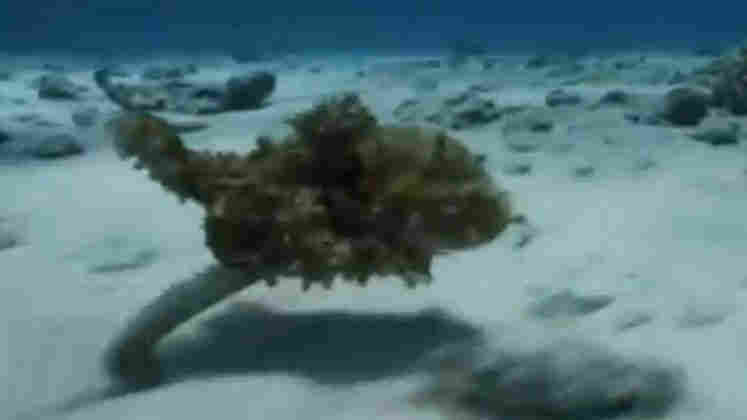 It can look and act like sea snakes, lion fish, giant crabs, shells and stingrays. Rare Sighting Of Dashing, Two-Legged Hairy Sprinting Crab? In Latin it's called Thaumoctopus mimicus, but I'd call it The Master. It's Meryl Streep in octopus form. There are ocean animals that can change shape, imitate plants, rocks, flora, and I've blogged about some of them. But this octopus is special. It seems to study other creatures and then imitate them, copying their moves and their bodies. It can do sea snakes, lion fish, flatfish, giant crabs, seashells, stingrays, jellyfish and weird beings that have no name, and maybe no earthly existence. Is it imagining? I don't know, but no scientist has ever seen a shaggy sprinting bipedal crab — until our octopus decided to be one.